Music is love, people highly rely on music to relax, and this is the reason digital radios are trending in recent time. The best part about the tabletop radio is, they are highly affordable and loaded with exciting features. The tabletop radio sounds not only a great choice to entertain yourself but also is easy to use. The setup and working are super easy even for the beginner. But before making a decision you must be well aware of the features to look for in a tabletop radio. The specifications also play a major role while investing in a cool gadget. Get the most out of your tabletop radio. Look for the following additional features in your radio apart from excellent make, and budget. If you are looking for a tabletop radio which is seamless and can be operated via mobile or computer, look for in build Bluetooth feature too. This feature will sync up your device and play the audio as per your choice. You can every play your favourite playlist from smartphone and tablets. There are many good tabletop radios which offers wired streaming connections for uninterrupted music supply. Does music helps you to get out of your bed, look for a tabletop radio which has inbuilt alarm. You have the option to select which day to set the alarm, so that you can have a peaceful uninterrupted sleep during the weekends. The alarm sound can be of your choice either a buzzer or a song or some radio station. There are some good tabletop alarm models which provide multiple independent alarm option, so now you and your partner can wake up as per their preferred time. 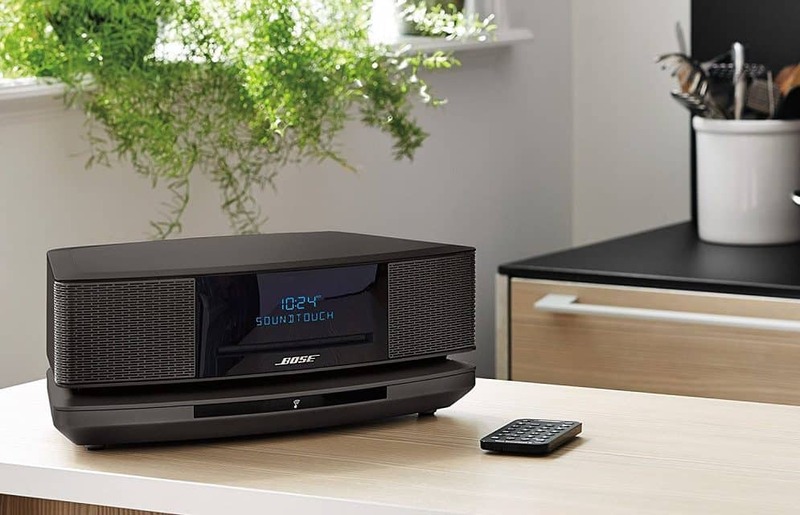 The feature of a dock is not much popular but it is highly helpful if you want to connect your smartphone and MP3 media player with the table top radio and play the music of your choice. A dock is nothing but a slot to connect the desired device to play music or it can be used for charging as well. There are some tabletop radios which offers touch sensitivity instead of using the traditional knob system and button for adjusting music and channel. The touch-sensitive screen is best for posh users. If you are planning a radio for the kitchen or while working out, it may not work well. If you are looking for the alarm feature you must look for the snooze button too. A prominent snooze button option helps you to take a break of an additional 10 minutes without furiously turning off the tabletop radio. This choice is totally optional but I would suggest you look for one which has inbuild snooze button option. It is not an essential accessory for the tabletop radio but if you are looking to use the radio for the living room and want to operate it from the kitchen, a handy remote is of great help. You don’t need to get up every time to change the channel, adjust volume or switch radio stations. It would be nice to look for remote control with sturdy buttons which can run for a long time. There are also some popular radio brands which provide a free app which can work as a remote control. In short, your smartphone is converted into a remote control and can be used in case the radio does not come with remote control. A USB port is a smart addition for all the digital devices, it allows you to plug a charger, phone, tablet, and other devices. This means the radio can get charged and also play some music. This is not found in many tabletop radio but a recording option is a great choice to record your favourite songs and shows. These recordings can be played in the future when you are free or want to listen to the same show in repeater mode. Always look for a tabletop radio which supports both AM and FM radio. These above-mentioned added features will make your life easy.